and forgave her after that. That was the cutest moment. Pearl needs hugs. the face she makes for Steven. Awww!!! I love Pearl so much!! Her uniform is so cute! Eeep! This is adorable and she is indeed a precious cinnamon roll! 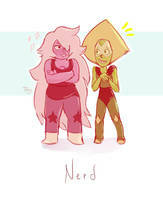 It how Peridot was raised to look down upon gems that are 'lower' status. She was ignorant of the situation and didn't know how truly offensive her words were to Pearl. 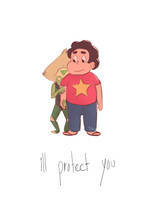 But Peridot in the end learn her mistake and apologized for it. She is getting quite the character development. That's what made the episode great. But Pearl here looks so adorable!! lol same. I still find it surprising when Pearl blushes blue. wow this is so cute !!! good job omg ! !